Provides fast effective relief for 8 common eye irritation symptoms. Long-lasting, moisturizing formula leaves your eyes feeling refreshed and comfortable. Dry, red, itchy, gritty, watery, stinging, irritated or burning eyes. Allergies to pollen, dust, ragweed and other allergens, colds. VISINE® Multi-Symptom provides soothing relief for itchy, watery eyes caused by allergies to pollen, dust, ragweed and other allergens, while it also relieves redness and helps clear away eye mucous build-up associated with both allergies and colds. Place 1 or 2 drops in the affected eye(s) up to 4 times a day or as directed by a doctor. CAUTION: Do not use if you have glaucoma or serious eye diseases. If you are pregnant or breastfeeding, consult your doctor before use. Do not use product while wearing contact lenses. If you experience eye pain or changes in vision, or if redness or irritation persist or increase beyond 72 hours, discontinue use and consult a doctor. Overuse of this product may produce increased redness of the eye. If solution changes colour or becomes cloudy, do not use. VISINE® eye drops are produced under sterile conditions. To help maintain sterility, replace cap after use and do not touch dropper to other surfaces. Store at 15-30°C. Keep out of reach of children. If swallowed, contact a Poison Control Centre or doctor right away. I was using this product to help with redness and as soon as I put it in it stung so bad. Would not recommend. I have not tried other Visine products and this experience will not encourage me to try again. We're sorry to hear this! We'd like to speak with you to learn more. Please give us a call at 1-800-661-4659, M-F 9am to 5:30pm ET. We hope to speak with you soon! I've been using it for many years and it helps my itchy and watery eyes a lot. I highly recommend it. Noticed my eyes have started to recently become very itchy and irritated during the winter. 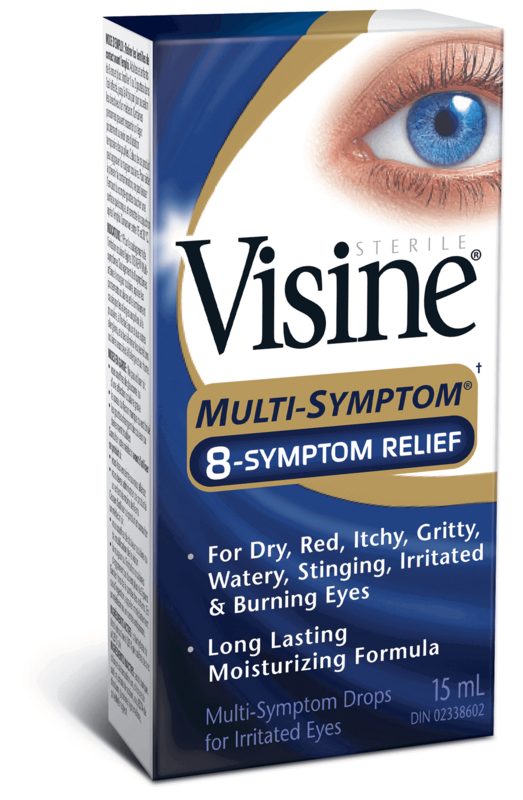 Bought visine to help, it burned my eyes so bad to the point that my eyes hurt and are very red all over my eyes. Visine does not work if your eyes are allready irritated. Thanks for bringing this to our attention! It's important that we learn more so we can help. Please reach us on 1-800-661-4659 between 9am and 5:30pm ET Monday-Friday. While on the phone, mention your reviewer name so we can connect our convo here to your call. This product really stings and burns. Not good when your eyes are already irritated. I wouldn't recommend. We're sorry to hear this! We'd like to learn more. Please give us a call at 1-800-661-4659. We're available Monday through Friday, 9am to 5:30pm ET. We look forward to speaking with you! Thank you for sharing your feedback with us! We're so sorry to hear you had this reaction after using our Multi-Symptom Relief. We'd like to learn more and do what we can to help, so please give us a call at 1-800-661-4659. We're available Monday-Friday from 9a-5:30p ET. We hope to hear from you soon! First time user and purchased these hoping that they would work for red gritty,watery eyes...after applying one drop in each eye they burned and stung my eyes ! I returned them and purchased the original drops. Thanks for the review! We're sorry to hear the Multi-Symptom 8-Symptom Relief didn't work for you. We'd like to learn more about your experience with it, and try to make things right. Please give us a call at 1-800-661-4659, Monday-Friday between 9A-5:30P ET. We look forward to hearing from you! Honestly been using Visine products for years. Normally great! Not this one! It hurts , burns and itches like sand in the eyes. Tried once a week ago though maybe just me. Nope same problem again. Not sure what’s burning! Would not buy buy again maybe try original or something. Side note : Not sure if my eyes are still burning but, it won’t let me put 1 star and 1 on the scale for quality and value. I also hope this problem gets resolved. We're so sorry to hear this! We'd like to look into this for you and see how we can help. Please give us a call at 1-800-661-4659 from 9AM - 5:30PM ET, Monday through Friday. Hope to chat with you soon! 3 lubricants soothe, moisturize, and protect. Which VISINE® product is right for you? 1Nielsen MarketTrack NAT XNFLD GB+DR+MM All Sales for L52Wks PE April 5, 2014. Based on highest Unit Vol of all Eye Drops & Washes brands. 1Suivi du marché Nielsen à l’échelle nationale, à l’exception de Terre-Neuve, Épiceries+Pharmacies+Grandes surfaces, ventes totales au cours des 52 DS, période prenant fin le 5 avril 2014. Selon le volume unitaire le plus élevé de toutes les marques de gouttes oculaires.